Ann B.Kim (USA) is a mixed media visual artist, art educator, and a perpetually conflicted believer of the grey zone. Her current obsessions and interests include historical remnants, cultural exchanges, cultural and linguistic boundaries, transnationalism, collective consciousness, and antipodes in addition to human memory, desire, and the concept of artists as wanderers. More specifically, she is interested in some of the core commonalities all human cultures tend to possess: its awareness of our inevitable mortality, how we try to explain it, manmade constructs that seem concrete such as the 24 hour time, time zones, and longitudes and latitudes that were created by our desire to understand our place in the world, but do not serve as definitions of time, space, and place as well as those constructs that seem apocryphal such as folklore. In a more metaphorical sense, she wants to create visual objects that are layered with these symbols: past, present, future, fragmentation, artifacts, imagination, layered on top of one another, completing the loop where all moments in time seem to coexist, and time is no longer thought of as being linear. Ann B.Kim, artist in residence, will showcase the mixed media sculptural paintings that were half-completed in Spain and brought to New Zealand to be completed along with her lunar cycle video project that she completed in each place with the most recent one being completed in Muriwai, comprising of 59 footages taken at the same spot on the beach. As part of the exhibit, she will also demonstrate nontraditional uses for materials such as dura-lar, concentrated watercolor, Open acrylic medium, and acrylic inks. Much of the work will delve into concepts of time, unexpected discoveries, and how to embrace the fact that things are almost never how you imagined them to be. 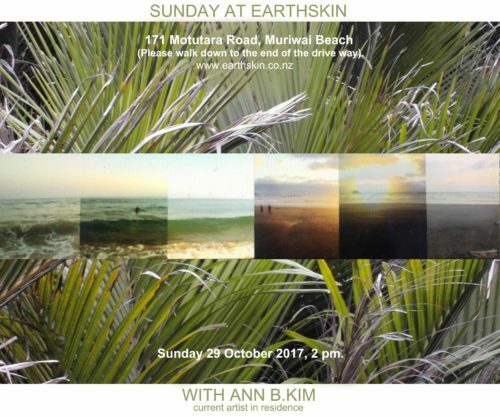 It will be held at Earthskin (171 Motutara Road, Muriwai Beach) on Sunday 29 October 2017, 2 pm. Please walk down to the end of the drive way (exception can be made if required). Siobhan Humston is an interdisciplinary fine artist who uses drawing as the foundation to her environmentally themed practice. She also works with fibre arts, sculptural installation, sound and film and is based in Vancouver, on the west coast of Canada. During her time at Earthskin, she will continue on the path of investigating aspects of land and sea through visuals and sounds, stillness and movement. The lush surroundings and close proximity to the ocean will provide her with boundless inspiration and she plans to do spontaneous land art pieces as well as work on graphite drawings, recordings of the sounds of nature: birds, waves, wind, rain, taking video footage and photographs of the same. 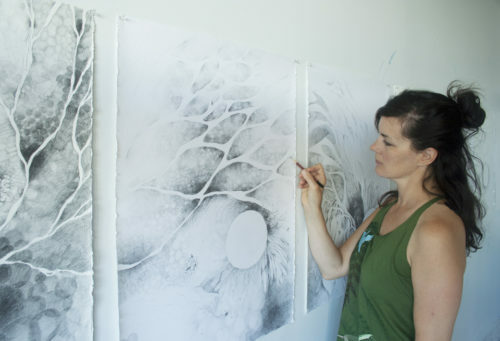 She considers the term ‘drawing’ loosely as she combines graphite pieces with photographs, sounds with film, sewn and woven aspects of nature with notes from her observations, building layered projects that interweave ideas around human’s interaction with the environment. 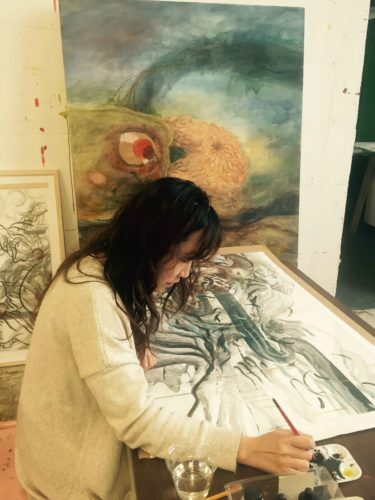 Her desire is to create works that help the viewer develop a deep connection with their natural surroundings, generating mindful, respectful impact and forward thinking discussions. 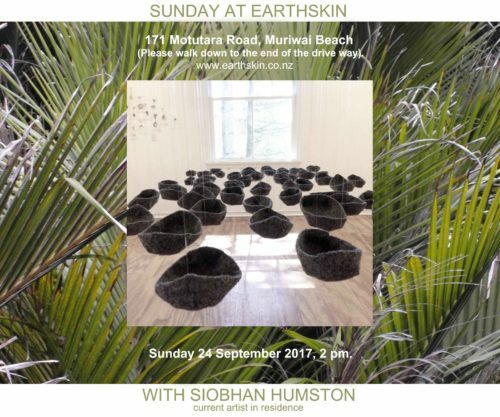 Everyone is welcome to join our monthly Sunday at Earthskin, September 24 with Siobhan Humston. Siobhan Humston will talk about art work created during her MFA studies in the UK, in her studio in Vancouver, and mostly recently, work in progress from her recent artist residency at Haida Gwaii Museum in northern British Columbia on the west coast of Canada. This includes graphite drawings, sculptural installation and collections of items found in nature. She will tie this into what was created during her time at Earthskin. Sharing visuals of her work and allowing guests to peruse her sketchbooks, notes and photographs, she will describe the methodology she developed called Day-to-Day Aesthetics. After her talk, Siobhan welcomes questions, discussion and interaction with the guests. It will be held at Earthskin (171 Motutara Road, Muriwai Beach) on Sunday 24 September 2017, 2 pm. Please walk down to the end of the drive way (exception can be made if required). Wesley Berg is a Visual Arts (drawing) and Installation artist from USA. 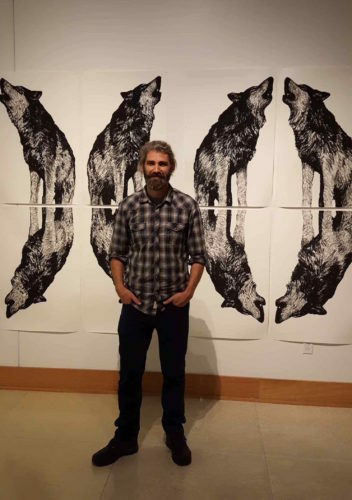 He has spent his artistic career studying the effects of our human presence in the natural world. Through experiential projects, he has sought to understand the symbiosis of living a creative life within nature. For his stay at Earthskin, he propose to produce a project involving drawing, mapping, text and experiential action, culled from his explorations of the natural area at Muriwai beach. He works with a call and response approach. He intend to respond directly to the local flora and fauna of the area. 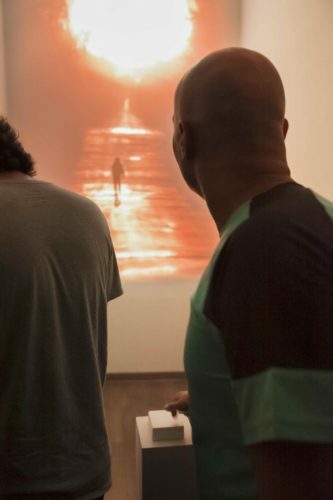 Often his work centers on comparing two disparate notions – one image relating to a natural presence and one image relating to a human (often unnatural) presence. Through a recontextualising of imagery he hopes to approach concerns that face our current modern society. “I will be exhibiting the drawings made here during my stay at Earthskin. The small ink drawings focus mostly on my work involving wolf imagery – which I use as a springboard for depicting tension, elegance, balance, calm, and somber beauty. My connection with the wolf stems from my time living in the American Southwest (New Mexico) along with 7 months living in rural Finland. Through trail running and hiking, I continually explore my natural surroundings, including here at Earthskin. Working with the wolf image now for a few years, to me, it becomes personified, and in many ways I am the wolf. We are the wolves” – Wesley Berg. It will be held at Earthskin (171 Motutara Road, Muriwai Beach) on Sunday 30 July 2017, 2 pm. Please walk down to the end of the drive way (exception can be made if required). Fabrizio Napoleone is a writer of Literary Fiction. Born in Switzerland and raised in Canada, he’s had 11 short stories published over the last decade. His first screenplay The Winter Line won Grand Prize at the Canada International Film Festival Screenplay Competition in 2010 and his writing has earned him several arts grants and fellowship residencies from around the world. He has also taught creative writing at Vancouver Community College. 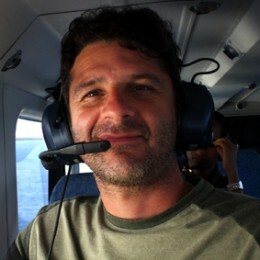 During his time at Earthskin, Fabrizio will focus his energy on completing his first novel. Please join Canadian writer Fabrizio Napoleone for an informal gathering to discuss the inspiration behind his current work-in-progress, a historical novel. Come and see how this writer has used his time in Muriwai to move closer to the final draft of his book. Fabrizio will read a short extract from this work, and he is happy to discuss and exchange ideas relating to the creative process by artists of all types. All artists, writers, and/or curious members of the public are welcome. 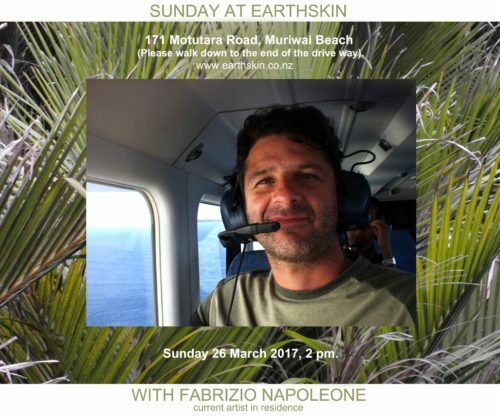 It will be held at Earthskin (171 Motutara Road, Muriwai Beach) on Sunday 26 March 2017, 2 pm. Please walk down to the end of the drive way (exception can be made if required). Dexter Davey is an Australian artist that predominantly works with the moving image. Currently transitioning a career away from the Hollywood industry into a more holistic minded fine arts practice. In his work he pursue the discovery and communication of fresh perspectives on divergent societies and cultures. Endeavouring to find how our similarities and also our differences can foster symbiosis with each other and the natural world. Earlier this year he spent one month in Tokyo shooting a new work with two contemporary Japanese dancers. At Earthskin he will be diving deep into the focussed fine detail of assembling the work which explores urban isolation and the dynamic of friendship. 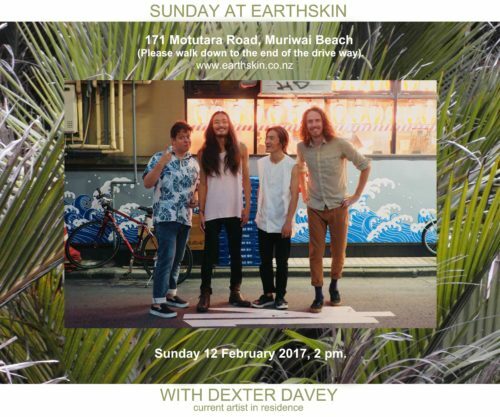 Everyone is welcome to join our monthly Sunday at Earthskin, February 12 at 2pm, with Dexter Davey. ‘Liberating Constraint’ with Dexter Davey. I never went to film or art school. As a result I found myself wanting to explore ways in which to push my practice. Join us for a discussion about some of the methods and ideas I have implemented into my practice to enable growth as an individual and a moving image based artist. Topics include the importance fun, exploring tactility, community & constraint in my research and practice. 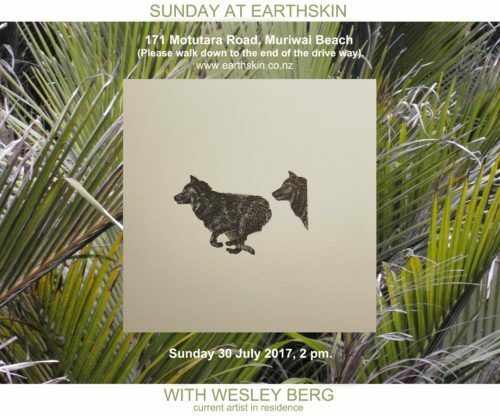 It will be held at Earthskin (171 Motutara Road, Muriwai Beach) on Sunday 12 February 2017, 2 pm. Please walk down to the end of the drive way (exception can be made if required). Launching ARTIS into our 2017 exhibition programme is British abstract painter John Blackburn. This year we will be showing paintings from the artist’s collection – dating back to 1964, alongside new works completed in New Zealand over the summer of 2016/17. John Blackburn is a painter of originality and vision. He was considered one of the most radical artists living in Auckland in the 1950s. In the 1960′s Blackburn returned to his native England where he has been a long time exhibitor at Jim Ede’s Kettle’s Yard Galleryin Cambridge. 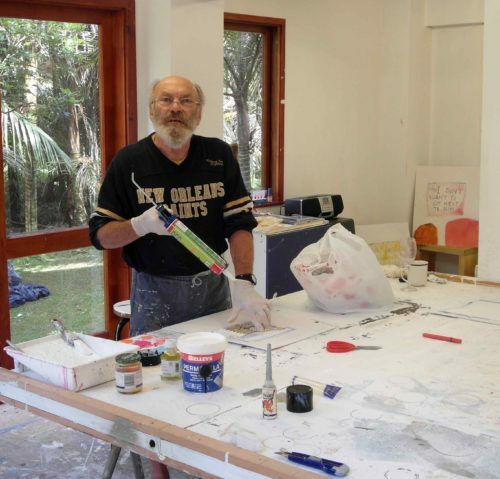 Blackburn returns to New Zealand every year to create a new series of works for exhibition. He also exhibits with Osborne Samuel Gallery in London and with galleries in Cornwall, Bristol and Edinburgh. Returning of the light. Seasonal musings! What is it that drives me to want to shout with joy every year, more than any other time of the year? New Year in New Zealand! Such a time, to regenerate our world and community, – reverse the spiral of dis-engagement with each other, family, community and our earth. We are ‘the Wayfinders” – moving on from discord to build our creativity and harness fresh ways to revitalise our lives, and re-engage with our waters and land. Change doesn’t come by itself: it comes by collaborating – injecting bold and innovative intent into everything we touch, and with everyone we meet. Likeminded people demonstrating and facilitating the richness and abundance that comes from growing healthy soils and food, restoring the biodiversity and caring for our waters and land together. It comes from sharing skills and time, past knowledge, place and community to honour our commitment to re-in-liven-ing the future. NEWSLETTER OF THIS 2017 YEAR. This year we step forward by welcoming our elder maestro of the Arts, John Blackburn for January. He lays the energetic carpet of fine and focused work for the upcoming Creative Residents to walk upon. With each successive year, the collective energy from each passing resident permeates and grows, and there is an awareness that people are present even in their absence. Engagement with the wider community and the land, including our worms, chickens, gardens, beach and bush, is nourishment for the future artists and brings diverse people together to celebrate, inspire, and be inspired! Below, is our Creative Residency schedule for 2017, which includes a return of some past artists of Earthskin who wish to apply again to see how their practice has grown after being at Muriwai, Te Moata, or Piha.